Voter Drive: Do Proportional Representation Systems Hold the Key to Higher Voter Turnout? The United States has experienced consistently low voter turnout, especially when compared to other democratic countries. This perplexing trend inspires this research paper, which tackles the question, “Why do some countries have higher voter turnout than others?” Economic characteristics, voting laws, party mobilization, education, and legislative term limits have all been theorized to affect voter turnout. However, this comparative politics study examines how electoral systems affect voter turnout. The paper specifically hypothesizes that proportional representation systems lead to higher voter turnout. This hypothesis rests on the theoretical link that proportional representation systems grant legislative seats to a wider range of parties, thereby increasing voter sincerity and perceived political efficacy. A cross-national analysis with linear regressions is employed to test the hypothesis. Findings from the analysis indicate that proportional representation systems in general do not lead to higher voter turnout, but larger district magnitude, a feature common in proportional representation systems, does lead to higher voter turnout. Therefore, the hypothesis is partially supported, and the relationship between electoral systems and voter turnout is further delineated. The Economist Intelligence Unit conducts annual reports on how democratic the majority of the world’s countries are. The study rates countries with five categories of criteria: electoral process, functioning of government, political participation, political culture, and civil liberties. Looking at The Economist Intelligent Unit’s most recent publication, Democracy Index 2013, the United States ranks a disappointing seventeenth. Meanwhile, tiny Norway ranks first overall (The Economist Intelligence Unit). Forget about ancient Greece; are Americans not the true founders of gun-slinging freedom and democracy, the shining light upon the hill? A closer examination of the study reveals that “political participation” held the largest gap between Norway and the U.S. (The Economist Intelligence Unit). Although political participation is a multifaceted concept, constructed with many different measures, one large, easily operationalized measure is voter turnout. Indeed, voter turnout in the United States is startlingly low, and it is not getting better. In fact, PBS reported voter turnout in the 2014 midterm elections to be the lowest in 70 years (Montanaro, Pathe, and Wellford). The entire concept of republicanism on which the United States is founded depends upon citizens to remain active in the political system by voting, among other things. As the Economist Intelligence Unit so pragmatically demonstrates, the democratic nature of a country diminishes without political participation by the citizenry. A broad range of theories has been put forth in an attempt to answer this question. These theories fall under six categories: electoral systems, economic characteristics, education, party mobilization, voting laws, and legislative term limits. The vast majority of literature here using the electoral systems variable believes that proportional representation increases voter turnout. However, there is disagreement on why proportional representation systems increase voter turnout. The literature also examines the effects of the presence of presidential races on voter turnout. Aside from electoral systems, economic characteristics represent another theory grouping. Income inequality is believed to be negatively correlated with voter turnout (Galbraith and Hale 2008). Government fiscal policy is also believed to have a direct effect on voter turnout. The educational literature aims to determine the relationship between both educational success and attainment on voter turnout. The political communication theory believes that greater party outreach and contact brings more voters out to the polls (Baek 2009; Karp 2012). The voting laws grouping spans from voter registration restrictions to compulsory voting laws. Compulsory voting laws are believed to be positively correlated with voter turnout, while voting restrictions are believed to depress voter turnout (King 1994; Singh 2011) The final theory of term limits proposes that the presence of term limits increases voter turnout (Bowler and Donovan 2012; Nalder 2007). A vast majority of my sources in this category found or assumed a positive relationship between proportional representation systems and voter turnout. However, one author vehemently opposes this common trend. Richard Kelly cites multiple reasons why proportional representation discouraged voter turnout. He claims that PR causes confusion by setting up complex methods of casting and counting votes, which in turn causes chaos shown by a large number of spoilt ballots. PR systems organize larger districts with more representatives, diminishing accountability and connection with the constituency. Often, PR systems use closed party lists denying people the right to vote for a single candidate and instead forcing them to vote for an entire party. Governments under proportional representation often are delayed in forming after elections. Coalition forming and party negotiations allow parties with low levels of support to take power, and devalue earlier campaign promises to voters. All of these factors, Kelly argues, are to blame for low voter turnout in British elections using the PR system (Kelly 2008). Aside from Kelly, Calca and Stokemer report mixed results when combining the effects of PR systems with election structure (2014). Their study finds that the addition of a PR system increased turnout in non-concurrent presidential elections, but decreased turnout in concurrent presidential elections (Calca and Stokemer 2014). This side of the argument is somewhat undeveloped. Kelly provides a very limited amount of data to justify his argument. Meanwhile, Calca and Stokemer do not propose any possible causal link to explain why PR produced mixed results in different election structures. Numerous sources theorize that proportional representation positively correlates with voter turnout. Where the differences lie is in the causal mechanism linking the two. One causal mechanism is that PR systems mobilize those on the fringe, because there is a broader range of parties running in elections. Banducci and Karp find that proportional representation increases voter turnout, especially by those on the far left (1999). This can be attributed to PR’s broader span of legitimate parties reaching out to radicals (Banducci and Karp 1999). Bowler, Brockington, and Donovan follow along by recognizing that CV systems, which are similar to PR, increase representation of minorities (2001). Political efficacy is another proposed causal mechanism. Voters believe their votes will count more in PR systems than in majoritarian systems, due to a lower threshold to win a seat. Banducci and Karp observe an increase in political efficacy by directly asking questions relating to perceived political efficacy before and after the introduction of PR (1999). Bowler, Brockington, and Donovan also recognize voter efficacy as a contributing factor (2001). PR systems also encourage a broader range of parties to campaign in a race, by giving more parties a realistic chance of winning some portion of seats. As a result, voters can feel comfortable placing a sincere vote for the candidate they truly feel closest to (Pillsbury 1995). This theory ties in closely with the first two causal mechanisms discussed above. Proportional representation leads to increased competition due to an increased number of parties, a lower threshold, and multi-member districts. Increased competition then leads to greater party mobilization, and public interest. In his work, Selb believes that proportional representation causes increased turnout by fostering increased competition (2009). Finally, Ladner and Milner hypothesize at the end of their work that PR increases voter turnout by promoting civic interest and education (2006). This hypothesis is set up for future research, and has little development in this current work. It is evident that proportional representation is widely assumed to increase voter turnout, but there is still a lot of disagreement as to exactly why. Aside from examining proportional representation, the presence and position of a presidential candidate within the electoral structure is examined. Calca and Stokemer examine whether the existence of a presidential race in an election influences the voter turnout in that election (2014). They compare turnout in three different election systems: parliamentary regime elections, presidential regime elections with the executive and legislative elections held on different days, and presidential regime elections with executive and legislative elections held concurrently (Calca and Stokemer 2014). The theory rests that concurrently held presidential elections would generate more voter turnout than non-concurrent presidential elections (Calca and Stokemer 2014). This is due to three reasons. First, legislative elections become less important without a presidential position on the ballot. Second, choosing candidates from two meaningful races simultaneously should increase the significance voters feel in casting their vote. Finally, there is the coattail effect, in which legislative candidates ride the wave of interest for their party’s presidential candidate (Calca and Stokemer 2014). Empirical evidence supports this theory, with concurrently held presidential elections and parliamentary elections garnering higher voter turnout than non-concurrently held presidential elections (Calca and Stokemer 2014). This theory relates to many others through the importance of political power. Presidents exude a powerful status in presidential regimes, while legislatures take somewhat of a backseat. In parliamentary regimes, however, the executive power resides within the legislature, giving parliaments an image of holding meaningful political power in voters’ eyes. This grouping includes income inequality, taxation, and government spending. A state’s income inequality is hypothesized to negatively correlate voter turnout (Galbraith and Hale 2008). This is possibly due to income inequality decreasing political engagement while increasing the opportunity cost of political engagement (Galbraith and Hale 2008). Furthermore, the upper class may be incentivized to discourage the lower class from voting (Galbraith and Hale 2008). This theory is supported by the results from the examined study. A government’s fiscal policies are also believed to affect voter turnout. The level of government spending on public goods programs is hypothesized to positively correlate with voter turnout (Bowler et al. 2007). The causal link explains that the importance of governments become more apparent to citizens, as more public goods programs impact citizens. As a result, electoral stakes will rise for potential voters (Bowler et al. 2007). At a state level within the U.S., the hypothesis is empirically supported (Bowler et al. 2007). On the other side of fiscal policy, taxation is also believed to influence voter turnout. The level of taxes on citizens is hypothesized to positively correlate with voter turnout (Bowler et al. 2007; Merrifield 1993). Higher levels of taxes impose higher burdens on citizens. In turn, citizens will take an active stand by voting (Bowler et al. 2007). This hypothesis is also empirically supported at a state level analysis (Bowler et al. 2007; Merrifield 1993). It appears that state governments have the power to raise voter turnout by pursuing more aggressive taxation and spending policies. Some have found education attainment to positively correlate with voter turnout, while others have found the relationship to be spurious (Green and Sondheimer 2010; Tenn 2007). First, let’s examine the reasoning behind the assertion that education does positively correlate with voter turnout. Several causal links has been proposed, yet none has affirmed its position as the definite causal link between education and voter turnout (Green and Sondheimer 2010). Three major causal links have been mildly supported in Green and Sondheimer’s study (2010). Education may provide the tools necessary to navigate the complex process of obtaining the necessary identification and registration to vote (Green and Sondheimer 2010). Education may also lead to increased voter turnout, by increasing interest in government and politics (Green and Sondheimer 2010). Finally, education may link to voter turnout, by expanding one’s social network and interaction with the local community (Green and Sondheimer 2010). Steven Tenn recognizes the theory that education increases ones interest in government and politics, which he labels the “civic education theory,” (Tenn 447, 2007). However, Tenn challenges this theory in his work, where he finds that marginal increases in educational attainment do not lead to an increased likelihood to vote (2007). He does, however, find that the being in an educational environment does positively influence the likelihood to vote (Tenn 2007). Tenn chalks up the previously found positive correlation to selection bias, meaning unobserved factors influence both educational and voting choices (2007). Party mobilization and contact positively correlates with multiple measures of political engagement, including voter turnout (Karp 2012). There are multiple theories as to why this relationship exists. Encouragement to vote from political parties may influence citizens feel that their vote is more valuable, raising political efficacy (Karp 2012). Party mobilization efforts may also promote a greater feeling of satisfaction among voters (Karp 2012). The institutional settings of political communication are also hypothesized to effect voter turnout through the causal link of mobilization (Baek 2009). Several components of these institutional settings are examined. Campaign finance systems that allow more money to be brought into a race are thought to positively correlate with voter turnout. Public broadcasting has been found to promote political engagement and is therefore thought to correlate with voter turnout. The same holds for newspaper readership. The tendency of partisan press to draw voters to parties also lends itself to higher voter turnout. Paid political television advertising is also believed to positively correlate with voter turnout (Baek 2009). All of these variables are thought to increase voter turnout by lowering the information cost for voters, and strengthening party mobilization (Baek 2009). These relationships are all supported by the results, except for the level of newspaper readership and partisan press, which failed to produce a significant relationship with voter turnout (Baek 2009). The theory of compulsory voting is relatively straightforward. Singh shows that the existence and severity of compulsory voting laws positively correlates with voter turnout (2011). The causal link is a simple rational choice. Individuals will vote, instead of facing the high likelihood of paying a fine (Singh 2011). Furthermore, as the likelihood and severity of fines increases, individuals have even more reason to vote (Singh 2011). While compulsory voting is found to increase voter turnout, measures restricting voting are believed to depress voter turnout (King 1994). Voter registration laws raise the cost of voting for citizens. The level of voter registration laws is found to depress voter turnout only through the indirect means of depressing voter registration (King 1994). Advocates of term limits have contested that term limits increase voter turnout mainly by creating more competitive races. Term limits necessarily bring about more open-seat races, which are believed to be more competitive (Nalder 2007). Open-seat races have also been believed to increase campaign activity (Bowler and Donovan 2012). However, open-seat races were not found to produce increased voter turnout in California state-level elections (Nalder 2007). Furthermore, Nalder’s regression analysis showed that term limits actually reduced voter turnout in California state legislative races (2007). Bowler and Donovan find in their analysis that term limits had no effect on voter turnout for state legislative races (2012). There are multiple suggestions as to why term limits failed to produce the hypothesized positive correlation with voter turnout. Since term limits produce more open-seat races more often, candidate name recognition may decrease, limiting voter knowledge and interest (Nalder 2007). Institutional rules, such as term limits, are also only one of the numerous influences on people’s view of politics (Bowler and Donovan 2012). The research question at hand asks, “Why do some countries have higher voter turnout than others?” There are several explanations to answer this question. I theorize, however, that whether or not a country has a proportional representation electoral system determines their level of voter turnout. My hypothesis follows, “If a country has a proportional representation electoral system, it will likely have high voter turnout.” In this hypothesis, the independent variable is whether or not a country has a proportional representation electoral system. The dependent variable is a country’s level of voter turnout. Our example of Norway and the United States supports this hypothesis. While Norway has a proportional representation system and ranks high in political participation, the U.S. has a majoritarian electoral system and finishes seventeenth (The Economist Intelligence Unit). The theory behind this hypothesis rests on the merits of the PR system. If a country has a proportional representation electoral system, it will award losing parties with some legislative representation. If losing parties are still awarded some legislative representation, voters will believe that their vote will count even if the party they are voting for is not expected to receive a large proportion of votes. If voters believe that their vote will count even if the party they are voting for is not expected to receive a large proportion of votes, voter turnout will increase. The ability of PR systems to award multiple parties some legislative representation should also increase the competition of political races and encourage party mobilization efforts, both of which have been found to increase voter turnout. This argument joins others in this literature review that regard such things as political efficacy, vote sincerity, party mobilization, and ideological range as positive influences on voter turnout. Using STATA Data Analysis, this study uses a cross-national analysis of over 350 elections. We are able to make more generalizable claims by including this large swath of cases from a range of years and countries. Elections from Australia, Asia, Africa, Europe, and the Americas are all studied. 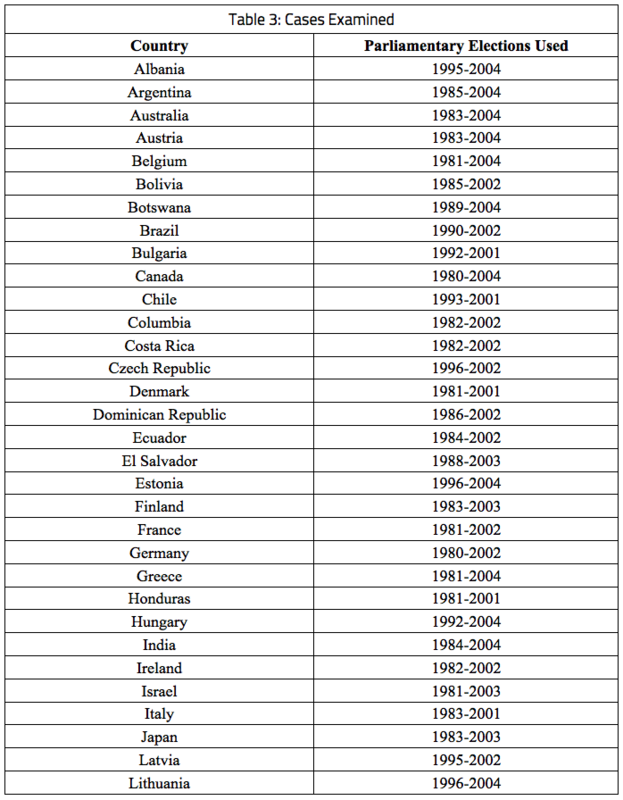 In order to ensure we are studying only true democratic elections, countries need to have at least scored a “6” on the Polity 2 measure from the Polity IV database (Polity IV Project 2000). Some democracies are also excluded due to data limitations. A complete list of countries and years included in this study can be found in the appendix. The dependent variable is the percentage of eligible voters who voted in legislative elections. Parliamentary or legislative elections allow a vast pool of cases to be studied. There are far fewer presidential elections to study. Aggregating parliamentary and presidential elections would have caused methodological challenges. This decision to solely observe legislative elections aligns with previous research (Blais and Dobrzynska, 1998; Kostadinova, 2003; Kostadinova and Power, 2007; Powell and Whitten, 1993). The International Institute for Democracy and Electoral Assistance provides the turnout data for this study (IDEA, 2008a,b). The presence of a proportional representation system was initially considered as a dummy variable. However, regressions using this variable failed to produce statistically significant results. Furthermore, this dummy variable does not account for the vast differences between PR systems. Instead, we measure district magnitude, which better captures our theoretical link between proportional representation systems and voter turnout. As a continuous variable, district magnitude provides a more descriptive measure that represents the variability within PR systems. The broad scope of elections covered includes those held in mixed member electoral systems. To apply our measure of district magnitude to mixed member districts, we take the average magnitude of the SMD and PR tiers. Data for district magnitude is sourced from Beck’s Database of Political Institutions (Beck et al. 2004). GDP per capita is measured, representing some of the economic theories presented in the literature review. This variable is lagged one year to better capture the effect of economic trends on voter turnout. Data for GDP per capita comes from the World Bank’s World Development Indicators (2006). Also mentioned in the literature review and considered in this test is the presence of compulsory voting. Finally, the presence of a bicameral legislature is considered. Data for these institutional variables comes from the Database of Political Institutions (Beck et al. 2004). Table 1 provides statistical summary of the variables used. Voter turnout is of course scaled 100 percent, with our mean resting at just over 73 percent. The lowest district magnitude is 1 seat, while the largest district had 150 seats. There is a large range in the GDP per capita, indicative of our global mass wealth inequality. Finally, the variables of compulsory voting laws and bicameral legislature are both binary, either recording a value of “1” to represent their presence, or of “0” to represent their absence. A bivariate and multivariate regression is performed. In both cases, an ordinary least squares (OLS) linear regression is used. An OLS regression will produce a sophisticated estimation of our models. Table 2 presents the results of the bivariate and multivariate regressions performed. District magnitude is the independent variable used in the bivariate regression, and all independent variables are incorporated into the multivariate regression. Voter turnout in parliamentary elections is the sole dependent variable used in either regression. All variables in the multivariate regression are statistically significant. GDP per capita does have a positive relationship with voter turnout, although our rounding to the nearest hundredth does not show the positive coefficient. This indicates that elections held during strong economic times and in wealthy states will experience higher voter turnout. Compulsory voting also produces a positive relationship with voter turnout, indicating that compulsory voting laws are effective in their purpose. Bicameral legislatures, however, generates a negative relationship with voter turnout. Bicameralism is one form of institutional complexity, which may lead to confused, disinterested voters. We can only speculate at this point. Most importantly, district magnitude has a positive, statistically significant relationship with voter turnout, both in our bivariate and multivariate regressions. This means that electoral districts with a larger number of legislative seats will experience higher voter turnout than those with fewer seats. How does this interface with our hypothesis and argument? First, our hypothesis is supported. Our argument also gains further weight. With more seats available in a district, the winning threshold is lowered, thereby allowing more parties to compete for seats. This broader spectrum of competitive parties allows for voters to cast votes for the party or candidate they like the most, not the “lesser of two evils.” There is a broader implication here that increased district magnitude is one of the characteristics of PR systems that increases voter turnout. And not all characteristics of PR systems help increase voter turnout, as shown by the failure of the PR dummy variable to produce a positive, statistically significant relationship with voter turnout. Therefore, this study complicates the dichotomous stance previous researches have taken as to whether PR systems increase voter turnout. Voter turnout has been a major focus of study in the realm of political science. Among other measures of political engagement, voter turnout contributes to how democratic a country truly is. An unengaged electorate can signal political dissolution. Therefore, political engagement is a very significant variable in examining our present political world and predicting future trends. Proportional representation has already received a wealth of coverage, but the literature reviewed here notes that more research is always needed to further explain and bolster the theory that proportional representation causes increased voter turnout. My personal theory details a hypothesis that seems reasonable when looking at the top players in The Economists Intelligence Unit’s rankings, all of which have PR systems. This study’s use of district magnitude to test the hypothesis lends both answers to the immediate research question, but also offers the broader implication that only certain elements of PR systems increase voter turnout. More research into what elements of PR systems increase voter turnout may help uncover what causal theories best link proportional representation to voter turnout. Banducci, Susan A. and Jeffrey A. Karp. (1999). “The Impact of Proportional Representation on Turnout: Evidence from New Zealand.” Australian Journal of Political Science 34 (November): 363-377. Baek, Mijeong. (2009). “A Comparative Analysis of Political Communication Systems and Voter Turnout.” American Journal of Political Science 53 (April): 376-393. Beck, T., Clarke, G., Groff, A., Keefer, P., Walsh, P. (2004). “New Tools and New Tests in Comparative Political Economy: The Database of Political Institutions.” World Bank Economic Review 15, 65–176. Blais, A., Dobrzynska, A. (1998). “Turnout in electoral democracies.” European Journal of Political Research 33 (2), 239–261. Bowler, Shaun, David Brockington, and Todd Donovan. (2001). “Election Systems and Voter Turnout: Experiments in the United States.” Journal of Politics 63 (August): 902-915. Bowler, Shaun, Mary Currin-Percival, Henk van der Kolk, and Garrick L. Percival. (2007). “Taxing, Spending, and Voting: Voter Turnout Rates in Statewide Elections in Comparative Perspective.” State and Local Government Review 39: 131-143. Calca, Patricia and Daniel Stockemer. (2014). 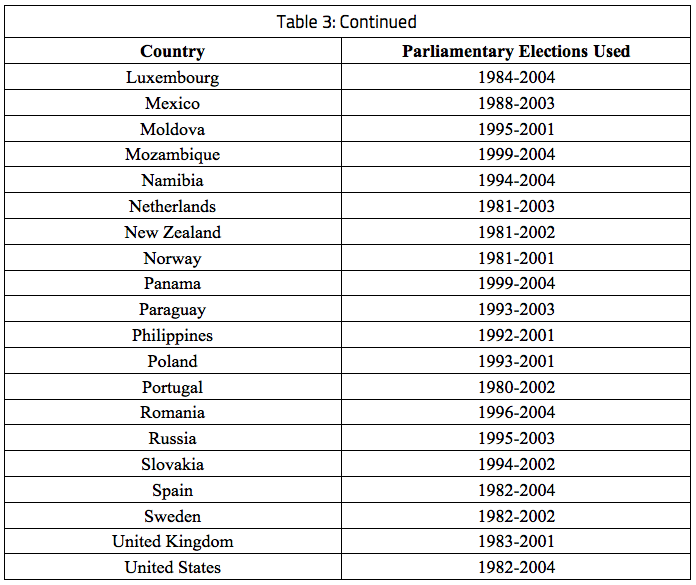 “Presidentialism and Voter Turnout in Legislative Elections.” Parliamentary Affairs 67 (July): 561-583. Galbraith, James K. and Travis J. Hale. (2008). “State Income Inequality and Presidential Election Turnout and Outcomes.” Social Science Quarterly 89 (December): 887-901. Green, Donald P. and Rachel Milstein Sondheimer. (2010). “Using Experiments to Estimate the Effects of Education on Voter Turnout.” American Journal of Political Science 54 (January): 174-189.
International Institute for Democracy and Electoral Assistance, 2008a. Compulsory Voting. http://www.idea.int/vt/parl.cfm (accessed 02.04.08). International Institute for Democracy and Electoral Assistance, 2008b. Parliamentary Elections. http://www.idea.int/vt/parl.cfm (accessed 30.03.08). Karp, Jeffrey A. (2012). “Electoral Systems, Party Mobilisation and Political Engagement.” Australian Journal of Political Science 47 (March): 71-89. Kelly, Richard. (2008). “It’s Only Made Things Worse: A Critique of Electoral Reform in Britain.” Political Quarterly 79 (April): 260-268. King, James D. (1994). “Political Culture, Registration Laws, and Voter Turnout among the American States.” Publius 24 (Autumn): 115-127. Kostadinova, T. (2003). “Voter turnout dynamics in post-communist Europe.” European Journal of Political Research 42 (6), 741–759. Kostadinova, T., Power, T.J., 2007. “Does democratization depress participation? Voter turnout in the Latin American and Eastern European transitional democracies.” Political Research Quarterly 60 (3), 363–377. Ladner, Andreas and Henry Milner. (2006). “Can PR Voting Serve as a Shelter against Declining Turnout? Evidence from Swiss Municipal Elections.” International Political Science Review 27 (January): 29-45. Merrifield, John. (1993). “The Institutional and Political Factors that Influence Voter Turnout.” Public Choice 77 (November): 657-667. Nalder, Kimberly. (2007). “The Effect of State Legislative Term Limits on Voter Turnout.” State Politics and Political Quarterly 7 (Summer): 187-210. Pillsbury, George. (1995). “P.R. and voter turnout: The case of Cambridge, Massachusetts.” National Civic Review 84 (Spring): 164-166. Polity IV Project. (2000). Polity IV Dataset. [Computer File; Version p4v2000]. Center for International Development and Conflict Management, University of Maryland, College Park, MD. Powell Jr., B., Whitten, Guy D. (1993). “A Cross-National Analysis of Economic Voting: Taking Account of Political Context.” American Journal of Political Science 37 (2), 391–414. Selb, Peter. (2009). “A Deeper Look at the Proportionality-Turnout Nexus.” Comparative Political Studies 42 (April): 527-548. Singh, Shane. (2011). “How Compelling is Compulsory Voting? 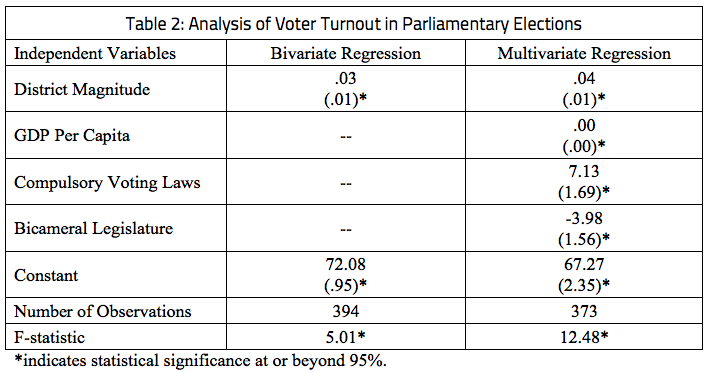 A Multilevel Analysis of Turnout.” Political Behavior 33 (March): 95-111. Tenn, Steven. (2007). “The Effect of Education on Voter Turnout.” Political Analysis 15 (Autumn): 446-464. World Bank (2006). World Development Indicators [CD-Rom]. World Bank, Washington, D.C.
Download a PDF version of this work.